Two weeks ago Laurence Silberman wrote a Wall Street Journal op-ed titled "The Dangerous Lie That 'Bush Lied'" to say how "shocking" he found former Associated Press reporter Ron Fournier's having twice asserted on Fox News that President George W. Bush “lied us into war in Iraq”. Silberman is a senior federal judge on the D.C. Court of Appeals and served as co-chair of the commission assigned in 2004-05 to evaluate the "intelligence community’s determination that Saddam Hussein possessed WMD". He warrants that it was intelligence that Bush relied on as his "primary casus belli" and reliance on what proved to be "dead wrong" does not make Bush a liar. There are weaknesses in his certitude. He cites the 2002 National Intelligence Estimate (NIE) and its "90% level of confidence" that "Saddam had weapons of mass destruction" as the leading determinant in Bush's decision. But that's not what the NIE said. "Baghdad has chemical and biological weapons" was the conclusion of the sixteen intelligence services, which then said only that "We judge that Iraq has continued its weapons of mass destruction (WMD) programs". Silberman doesn't make that clear. His "Saddam had weapons of mass destruction" leaves the reader to assume nuclear weapons, especially use of the word "destruction", which one doesn't commonly associate with chemical and biological weapons. So that led us to wonder how close to accurate were Judge Silberman's other assertions to absolve the 43rd president. He reminds us that "Saddam had also attempted to assassinate former President George H.W. Bush" in Kuwait in 1993, "But President George W. Bush based his decision to go to war on information about Saddam’s WMD". Implicit is that the younger Bush was not motivated by revenge. But the judge doesn't get to erase what Bush had said. In a September 2002 campaign speech six months before the invasion, Bush cited a number of reasons why Saddam was so dangerous to the U.S., among them, "After all, this is the guy who tried to kill my dad". He would refer to the assassination attempt again that month in an address at the United Nations General Assembly, urging adoption of a resolution demanding that Saddam surrender his WMD. We could also cite Lt. Gen. Jay Garner, whose perspective on the cause of war as the first proconsul in Iraq before Paul Bremer's disastrous reign was more immediate than than that of Judge Silberman sitting in D.C. a year or two later. Garner said of George W. Bush that "he had a burr in his saddle on Iraq because they made an assassination attempt on his father". Silberman wants us to believe that Bush based the decision to attack Iraq in 2003 solely on the intelligence handed to him. But longer memories recall Richard Clarke saying that, on the night after 9/11 two years earlier, Bush had demanded "Iraq, Saddam, find out if there is a connection”. The origin of the 9/11 attacks was al Qaeda in Afghanistan, but there was an eagerness to go after Iraq from the start and the intelligence that Silberman says Bush relied on came later and was made to order  raw intelligence free of analysis "cherry-picked" and "stove-piped" straight to the top were the terms of choice at the time. In leaked minutes of a meeting at 10 Downing Street, Richard Deerlove  "MI6", Britain's chief of intelligence  fresh from a trip to Washington where he learned of U.S. manipulation of intelligence first hand, reported to Prime Minister Tony Blair that “The intelligence and the facts were being fixed around the policy”. Not just a lie, a "Big Lie"
It's important to document the actual history of those days, when there was a choice to be made, since this version, repeated often enough without a single objection soon becomes the new reality. Q: So there was no choice -- so there was no choice between the course we took and leaving Saddam Hussein in power? Nothing else that might have worked? THE PRESIDENT: Well, we tried other things. As you might remember back then, we tried the diplomatic route: 1441 was a unanimous vote in the Security Council that said disclose, disarm or face serious consequences. So the choice was his to make. And he made -- he made a choice that has subsequently left  subsequently caused him to lose his life under a system that he wouldn't have given his own citizens. We tried diplomacy. 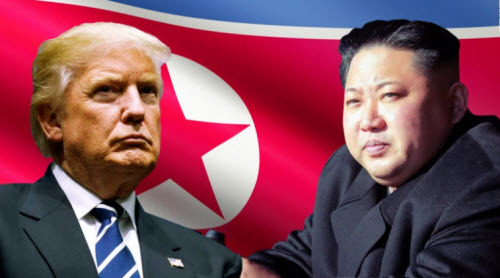 As a matter of fact, not only did I try diplomacy; other Presidents tried diplomacy. The United Nations, the nations of the world, speaking in unity, gave Saddam Hussein an ultimatum to disclose his Weapons of Mass Destruction and to disarm (destroy his illegal weapons, (specifically defined as WMD along with certain long range missiles.) He then adds that this was encompassed in Resolution 1441 which stated that if he refused, he would face "serious consequences" which is diplomatic language for war. This statement is so clear and reasonable, if only it were true. This was not an off the cuff answer. This is the story that is being repeated to the public. It could be taken from this description of Joseph Goebbels' "Big Lie," that if you you repeat something consistently over a long enough period, even though false, it becomes a new reality. O.K. He couldn't "disclose" what he didn't possess; now what about the "destroy" part of the ultimatum? The assessment from the weapons inspectors took account of Iraq's cooperation since Nov. 27, when inspections in Iraq resumed for the first time since 1998, after the Security Council passed a unanimous resolution. In addition to casting severe doubt on the reported Iraqi attempt to buy uranium in Niger, Dr. ElBaradei said that ''there is no indication that Iraq has attempted to import aluminum tubes for use in centrifuge enrichment'' of uranium into weapons-grade material. For months, American officials have cited Iraq's importation of these tubes as evidence that Mr. Hussein's scientists have been seeking to develop a nuclear capability. Mr. Blix reiterated that the destruction of 34 Al Samoud 2 missiles in the past week "constitutes a substantial measure of disarmament indeed, the first since the middle of the 1990's. We are not watching the breaking of toothpicks." Disarm? : far from refusing, Iraq was acceding to the demand, as reported by the U.N. Chief Inspector. It should be remembered that U.N. Security Council Resolution 1441, adopted in November 2002 regarding Iraq, was also unanimous but not definitive. The consensus was an additional resolution would be needed to authorize action against the Baghdad regime. But when Washington tried to get such a resolution, it failed to even muster a majority of the Security Council, with three veto-yielding members (China, Russia and France) opposed. This wasn't from the New York Times or the Washington Post. It was from the July 26, 2006 edition of The Washington Times, considered the Fox News of the print media. Ari Fleischer, the White House spokesman, said today that President Bush was hopeful that war could be averted, but that to escape military action, Iraq must disarm and Mr. Hussein must be deposed. That combination of events, he said, looked highly unlikely. Pressed on the point, Mr. Fleischer said both would be necessary conditions because disarmament was the United Nations' goal and changing Iraq's government was the president's. The statement puts the United States on a different track from the United Nations, whose resolutions have been concerned with the immediate and unconditional disarmament, not with a change of government in Baghdad. that Saddam must give up power. the above report from a New York Times article concluded with, "All pretense of Iraq being attacked based on the will of the international community was abandoned." There are those who are convinced that everything that President Bush has said about this war is a lie, most importantly his underlying motivation for it in the first place. While some may refute this, and many do, how does one justify his blatant rewriting of the events leading up to this war. We could not have possibly attacked Iraq because Saddam refused to "Disclose and Disarm." He was disarming and he had nothing to disclose. This is irrefutable fact-- from the President's own words, that of his press secretary, and the most extreme right wing newspaper in the country. A few days ago there was a highly recommended sketch by a noted humorist that showed a video of a fictional White House reporter challenging the President at a news conference. While most of us were enjoying the satire, I almost believed it was real. And I was somewhat peeved that I was tricked into buying into it. Perhaps I was made numb by the routine bizarre fiction coming from the highest office in the land. What I find more incredible than the satiric video is that among the assembly of White House correspondents who listened to President Bush say these words, not a single one stood up and challenged him. Not a single one of these "respected" journalists was willing to state the facts that refute his statement, to incur the wrath of this one man, who willfully and purposefully perpetrated an illegal act of war; and now has the effrontery to attempt to rewrite history, by erasing his crime with this "big lie." As the confirmation hearings by the Senate of John Brennan to be named CIA director drew near, the heat intensified over the program of death by drone enough to cause the Obama White House to finally relent, pledging to release to lawmakers the document that it had even gone to court to keep secret. An opinion from the Office of Legal Counsel, the document gives the President legal cover for killing, without due process of trial, an American citizen in September of 2011 in Yemen and of his 17-year-old son two weeks later. The practice of conjuring after-the-fact legal justifications for deeds already done brings to mind the opinions issued by that same office during the Bush administration that blessed “enhanced interrogation techniques”, otherwise known as torture. As the use of drones increased in the Waziristan tribal areas of Pakistan, inaccessible to U.S. ground forces, a New York Times exposé in May of 2011 revealed that the White House itself was calling the shots from a “kill list” maintained by Obama’s counter-terror advisor, John Brennan. He who has now been nominated to head the CIA. The drone war, since ramped up in Yemen and elsewhere, has still not even been acknowledged to exist by the White House. The Obama administration has decided that it is none of the public’s business. The White House has steadily denied Freedom of Information Act requests to obtain copies of the 2010 opinion the Office of Legal Counsel’s served up to make the assassination by this administration of even Americans legal (see related story). What irony, considering that on taking office, this president, over the protests of the CIA, found it only proper and transparent to release the similar and linguistically tortured Justice Department legal opinions that absolved the Bush administration of its physical torture practices. January 20th. It is a moment when our adversaries may probe for weakness and will be tempted to test us." This quotes from fairly deep in our earlier piece on Donald Trump's world outlook and the concern that, as we make the transition to a new and inchoate administration, Vladimir Putin might find our moment of disarray irresistible for making his next move. really need all this to go after a 19-year-old? the atrocity. Redundancies in the system caught the disparity and “there was a ping on the outbound to Customs”, one of the divisions of the DHS, she said. That puzzled Sen. Lindsay Graham (R, SC), who had been told by the FBI that "that they had no knowledge of [Tamerlan Tsarnaev] leaving or coming back". But the FBI is separate  a part of the Justice Department. Both they and CIA had added the older Tsarnaev to two different watch lists in 2011. CIA notified State and DHS. They had been tipped off by Russian intelligence, suspicious about the U.S. transplant from Dagestan even before he went to Russia. But neither CIA nor FBI noticed when Tsarnaev last year went back to the mother country. What we are hearing is that what one agency knew was not shared with the other and that databases are where information goes to die. Russia had warned the FBI twice, calling the older brother "a follower of radical Islam" who had "changed drastically", yet the FBI dropped the matter because a law prevents them from indefinite surveillance, they now say. That ping to Customs? 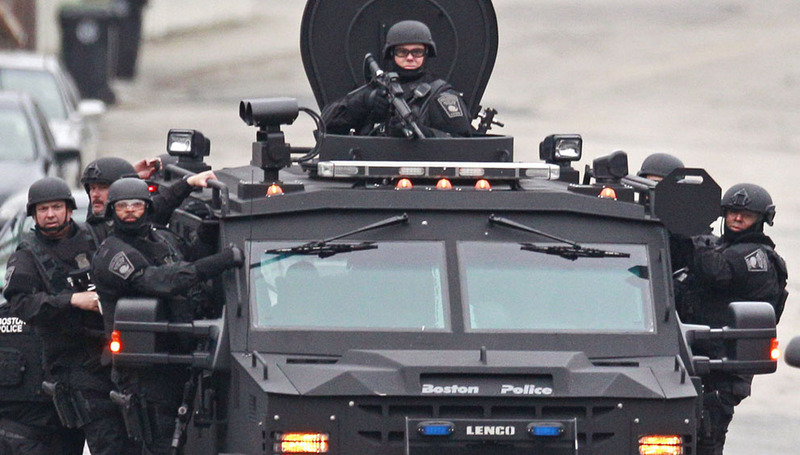 That was relayed to the Boston area FBI-led Joint Terrorism Task Force. There is no evidence so far that they took any action. This account and another by the New York Times reminds us of George Tenant warning the president in the summer of 2011 that "the system is blinking red" and yet the signals were once again missed. Here's what it was like in the prelude to 9/11, which we offer to compare progress between then and now. 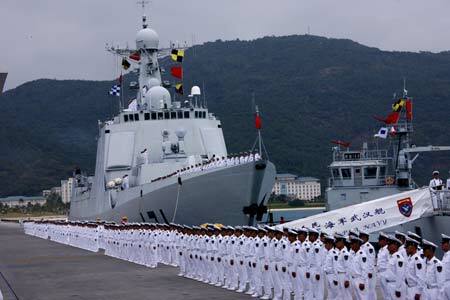 A U.S. guided missile destroyer sailed last week within 12 miles of an artificial island constructed by China to symbolically insist that navigation of the seas will remain free, that the international convention's 12-mile exclusion can only be declared by a sovereign owner of territory, and that disputed Fiery Cross Reef does not belong to China. 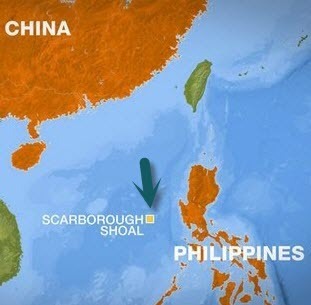 Yet now China is moving still further from its takeover of certain of the Spratly and Paracel Island chains to Scarborough Shoal, clearly far from China and on the edge of the Philippines (click map to expand). 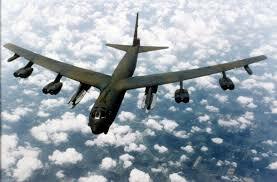 The B-52. Its maiden flight was in 1952.
takeover of disputed islands, rocks, and reefs in the Spratly chain  never mind that they are in international waters. After the 10th anniversary of the U.S. invasion of Iraq this March and the "Mission Accomplished" moment of May, 2003, that just passed, history is slowly being rewritten to soften the image of George W. Bush, as was apparent in the dedication ceremonies for the Bush Library in Dallas in late April. "He kept us safe" is what the former president wants us to remember, to earn credit where credit is due for constructing the vast security apparatus that prevented any further attacks on U.S. soil for almost a dozen years until Boston. 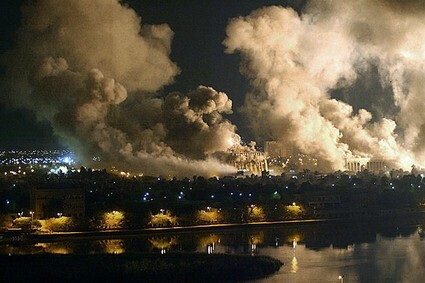 The Iraq invasion is another matter, and it is fair on the 10th anniversary of its March 19, 2003 commencement, followed only six weeks later on May 1 by the heralding of "Mission Accomplished", to assess the results of that disastrous war. Many in the media have done so. But instead, let's go back to how it began and recount just how we managed to blunder into so costly a mistake. It's an extraordinary story: the deceptions the Bush/Cheney/Rumsfeld administration spun that many would call treasonous to lure the American public into endorsing an unnecessary war. We shouldn't allow that memory to dim as the nation faces new threats and considers taking new military actions in Syria and Iran. 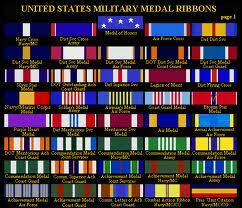 the opprobrium heaped by some misguided elements on those who fought in Vietnam, we have honored the troops who have served in Iraq and Afghanistan deservedly this time around. But there are those that say we have taken this too far. In January of this year, President Obama announced a revamping of the military that entails budget cuts of $487 billion across ten years. Before leaving office last year, Defense Secretary Robert Gates had already trimmed several hundred billion dollars by shutting down costly weapons programs, notably the F-22 fighter. And beginning this January 2, barring further action, another $500 billion over ten years will be lopped off the defense budget by law.